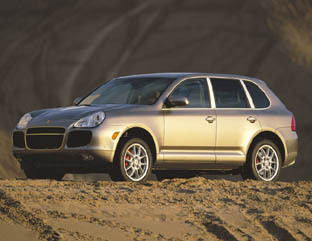 The first-generation Porsche Cayenne Turbo was one hell of a machine. Eclipsed only by the Turbo S for power. It featured a twin-turbocharged 4.5-liter V8 engine which produced 450 horserpower and 457 lb-ft of torque. The transmission was a Six-speed Tiptronic S automatic unit. Yet despite the fact most Cayennes will never see a speck of mud, if you do get the chance to take one off the beaten track it will prove itself to be a worthy companion. A special Advanced Off road Technology Package was also offered for the Porsche Cayenne Turbo S which included special under-vehicle protective plates as well as a 100 percent differential lock on the rear axle.